In discussing results, NEXT Biometrics CEO Tore Etholm-Idsoe said, "Throughout 2015, NEXT and its partners realized several key Smart Card-related development milestones regarding using NEXT fingerprint sensors for this important market. During this period and continuing into 2016 NEXT has focused large parts of the R&D resources to Smart Card activities, and NEXT sees significant opportunities within several of the major volume Smart Card market segments." Smart Card Ramp-Up Milestones to be passed. Etholm-Idsoe said, "At present, NEXT is ramping up Smart Card related plans and activities regarding use of NEXT fingerprint sensors in this important market sector. Investments and the distribution of these are under discussion with strategic partners. Dependent of activity in this area, the group cash position may cover less than 12 months of operations and the NEXT Board will accordingly initiate activities to ensure relevant company financing." Regarding fourth quarter and 2015 performance, Etholm-Idsoe detailed product developments, noting that up until the third quarter, NEXT delivered sample, test and integration modules to Dell. Then, November and December of 2015 were the first months of volume deliveries for launched Dell Notebooks and Tablets. Costs related to transition to new products and volume ramp-up have been booked in the fourth quarter of 2-015 and will be booked in the first quarter of 2016. The CEO said that the NEXT ASIC project, which is the last major element in the ongoing cost down program, experienced delays in 2015 but is now proceeding well with targeted first volume production lots expected in the fourth quarter of 2016. In discussing sales and market activity, Etholm-Idsoe noted that, "NEXT has focused its resources on quality dependent market segments that require high levels of security and convenience coupled with the ability to serve close to 100% of a given population. These markets include Smart Cards, NEXT-Enabled markets, traditional markets, high-end smartphones and quality notebooks. The NEXT technology is well suited for these markets. In addition the Company has made great leaps in R&D in the Smart Card space and will continue to focus on this market in the future." He noted that NEXT in the fourth quarter of 2015 secured a private placement of 120 million Norwegian Krone (NOK), or $14.5 million USD, from Greenbridge Partners, a privately held Investment Company founded by Melker Schörling and Ola Rollén. This placement of 2,000,000 new shares and the exercise of warrants of 93,750 by Icreate Investments Limited, an affiliate of the Foxconn group, resulted in gross proceeds of NOK 127.5 million." Discussing fourth quarter and full year 2015 results, he said operating revenue in the fourth quarter of 2015 was NOK 1.7 million, compared with NOK 0.2 million in the previous quarter and NOK 4.4 million in the fourth quarter of 2014. The revenue in the fourth quarter of 2015 was generated by shipment of 46,000 fingerprint sensors. For the year 2015, operating revenue amounted to NOK 4.6 million compared with NOK 6.3 million for 2014. The revenue for the year 2015 was generated by shipment of more than 100,000 fingerprint sensors. He explained, due to low production volumes, manufacturing costs have been high and the calculated gross margin is negative. The production costs for these initial delivered sensors are currently included in other operating expenses. Several of the initial cost elements related to production and delivery of these units are one-offs, or temporary, and do not give a clear and relevant cost of goods sold. The company said payroll expenses amounted to NOK 20.9 million in the fourth quarter of 2015, compared with NOK 14.4 million in the previous quarter and NOK 6.4 million in the corresponding quarter of 2014. The quarterly increase of NOK 6.5 million was mainly due to increased accrued social cost related to share-based remuneration. In addition, increased research and development (R&D) costs included in payroll expenses and increased operational activity in Asia were the main reasons for the increase from the corresponding quarter of 2014. Payroll expenses for the year 2015 amounted to NOK 54.0 million compared to NOK 21.9 million for the year 2014. The increase was mainly due to higher R&D costs, increased operational activity in Asia and increased accrued social cost related to share-based remuneration. Other operating expenses amounted to NOK 25.6 million in the fourth quarter of 2015, compared to NOK 15.5 million in the previous quarter and NOK 33.6 million in the corresponding quarter of 2014. The increase from the previous quarter of NOK 10.1 million was mainly related to increased production costs and additional write-down of inventories. R&D costs included in other operating expenses decreased to NOK 5.6 million in the fourth quarter of 2015, compared to NOK 7.6 million in the previous quarter and NOK 7.3 million in the corresponding quarter of 2014. Other operating expenses amounted to NOK 73.0 million for the year 2015 compared to NOK 66.8 million for the year 2014. The increase of NOK 6.2 million was mainly due to increased operational activity in Asia. Total R&D expenses, included in both payroll and other operating expenses, amounted to NOK 52.6 million for the year 2015 compared to NOK 38.8 million for the year 2014. Depreciation and amortization amounted to NOK 0.7 million in the fourth quarter of 2015 compared to NOK 0.7 million in previous quarter and NOK 0.4 million in the corresponding quarter of 2014. For the year 2015 depreciation and amortization amounted to NOK 1.9 million compared to NOK 0.6 million for the year 2014. Investments amounted to NOK 0.7 million in the fourth quarter of 2015 compared to NOK 0.4 million in previous quarter and NOK 1.3 million in the corresponding quarter of 2014. Investments for the year 2015 amounted to NOK 18.5 million compared to NOK 2.1 million for the year 2014. The main investment in 2015 was the coating machine with a capacity of 1.2 million units per month and a total investment of NOK 15.5 million completed in the second quarter of 2015. Net financial items amounted to a net cost of NOK 2.1 million in the fourth quarter of 2015 compared to a net income of NOK 0.5 million in the previous quarter and a net income of NOK 2.6 million in the fourth quarter of 2014. The decrease of NOK 2.6 million in net financial items from the previous quarter was mainly related to the net present value effect of the one-time payment related to the termination of inventor royalty agreement. For the year 2015 net financial items amounted to a net income of NOK 0.3 million compared to a net income of NOK 2.9 million for the year 2014. The decrease was mainly due to the net present value effect of the one-time payment related to the termination of the inventor royalty agreement. NEXT said, net loss in the fourth quarter of 2015 was NOK 47.5 million compared to a loss of NOK 29.9 million in the previous quarter and a loss of NOK 33.4 in the fourth quarter of 2014. Net loss for the year 2015 amounted to NOK 121.5 million compared to a loss of NOK 79.8 million for the year 2014. The increased loss was mainly due to increased R & D costs and increased operational activity in Asia. Regarding cash flow and balance sheet, NEXT said cash and cash equivalents amounted to NOK 130.2 million at the end of 2015 compared with NOK 129.3 million by the end of 2014. The operations, including investments, consumed cash in an amount of NOK 44.2 million in the fourth quarter of 2015 compared to NOK 30.6 million in the previous quarter and NOK 37.2 in the fourth quarter of 2014. The net proceeds of the private placement of 2,000,000 new shares, the exercise of warrants of 93,750 and the exercise of 62,100 options gave total gross proceeds of NOK 129.1 million. The Company's share capital is NOK 13,473,515, divided into 13,473,515 shares with a par value of NOK 1 per share. Total cash consumed for the year 2015, including investments, amounted to NOK 128.1 million compared to NOK 114.2 million for the year 2014. The cash consumed for the year 2015 was mainly related to the loss of NOK 120.8 million and investments of NOK 18.5 million. Equity amounted to NOK 172.7 million by the end of 2015 compared to NOK 161.6 million by the end of 2014. This was mainly due to the net proceeds of NOK 129.1 million described above and the loss of NOK 120.8 million in 2015. Enabled by its patented Active Thermal Principle, NEXT Biometrics offers high quality area fingerprint sensors at low prices. A wide range of product formats including Smartphones, tablets, PCs, doors, time registration systems, payment terminals, flashdrives, USB-tokens, keyfobs and many more are targeted. NEXT Biometrics Group ASA (OAX: NEXT) is a publicly-listed company headquartered in Oslo, Norway and with sales, support and development subsidiaries in Seattle, Silicon Valley, Taipei, Prague and Shanghai. For more information about the company, please visit www.nextbiometrics.com. Media and Investor contacts for NEXT Biometrics are Tore Etholm-Idsøe, CEO, Tore.Idsoe@NEXTbiometrics.com and Knut Stalen, CFO, Knut.Stalen@NEXTbiometrics.com. 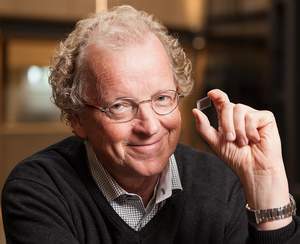 Tore Etholm-Idsoe, CEO of NEXT Biometrics, the leader in high-quality low-cost fingerprint sensors, holding NEXT's Ultra-Thin Fingerprint Sensor.